It’s hard to believe it has only been one year since the horrific massacre in Mumbai, India, an event that changed us all forever. It didn’t matter if you had ever walked into a Chabad house in your life or not, the Kedoshim who lost their lives belonged to all of us and the terrible loss that we suffered shook us to the core. In the days that followed, we all struggled to try to find some way of coming to terms with this terrible tragedy that happened half a world away yet touched us so deeply. We found ourselves us wondering what we could do, how we could help. While some people took out their Siddurim or their Tehillim and davened, others got to work spearheading tzedaka campaigns. One person in particular decided to use his talents and his connections to do something for both those who lost their lives in Mumbai and those of us who were trying to cope with the horror that had transpired. That person was Sruly Meyer who used his connections in the Jewish music industry to bring us Chasoif. I don’t know how many musical tributes were composed to honor the Kedoshim of Mumbai, but Chasoif stood out from the others as so many of us turned to music for solace. At a time when our lives seemed so full of darkness and despair, Chasoif was more than just a song. It was a beacon of hope that we all needed so desperately. What was it that made Chasoif so special? For me it was that everything about this song was right. 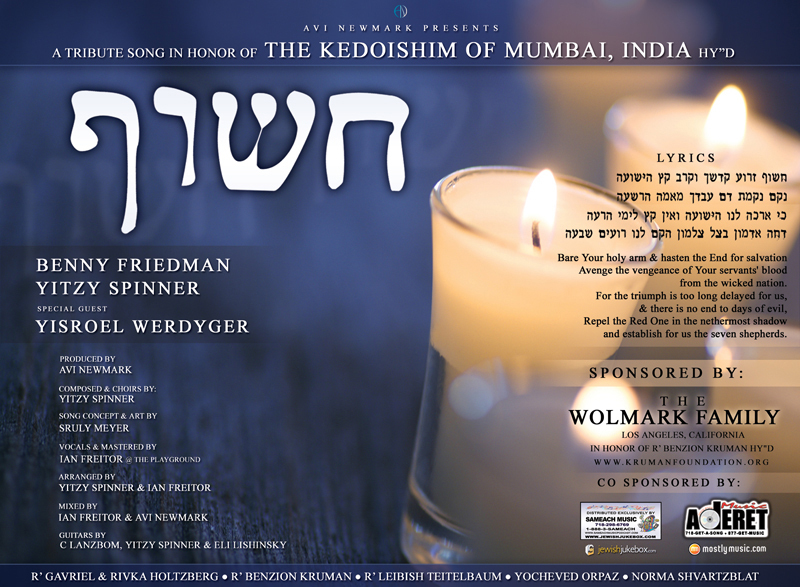 Released as a free download to raise money to rebuild the Chabad house in Mumbai and aid the families of those who died Al Kiddush Hashem, it was music with a mission. It brought together a diverse group of people who worked tirelessly to bring this project to fruition. Funded by the Wolmark foundation, with additional funding by both Sameach Music and Aderet Music, the credits on this CD are long and impressive. Composed by Yitzy Spinner, produced by Avi Newmark. Vocals by Benny Friedman, Yisroel Werdyger and Yitzy Spinner. Ian Freitor, Eli Lishinsky, C Lanzbom and Sruly Meyer also lent their talents to this inspiring project, yielding a poignant song that is haunting and hopeful at the same time. Chasoif delivered a powerful and timely message to all of us: no matter how dark it may seem, no matter how much we despair, we remain steadfast in the knowledge that Hakadosh Baruch Hu will one day bring our ultimate salvation. A year later, the song is just as touching as ever. While so many bright lights were extinguished one year ago today in Mumbai, the spirit of ahava and achdus that grew out of this tragedy continue to burn brighter than ever. To download Chasoif, click here. To donate to Chabad Mumbai Relief Fund, click here. One year ago today HKBH brought home people with vision. One year ago today our eyes dimmed with the tears of a little boy crying for his mother. Today one year later, we must redouble our efforts to hear the cries of those members of our nation who don’t even realize they are crying….